Home Made is always the best. Don't you think so? Of course. Anything home made is always the biggest food pleasure. Then again, these days, there are food outside claimed or maybe really, is home made style. I am rather confused actually on how far further should we discuss or take up the food matter about homemade food sold outside. Home made in our house on the other hand is pure, clean and cooked by pouring lotsa love. Basically because, we cook meals for our love ones by considering who eats what, or who don't eat what not. In my house. noodles are our food happiness. We simply adore a piping bowl of mostly soupy noodles. 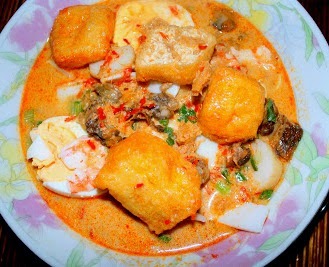 Like this Home Made Curry Mee. A halal version, due to my other half-half does not eat pork. See, I told you? We cook by considering our love ones and what they eat or not? Home Made Curry Mee. Broth a produce of prawn shells and head, and curry paste an amalgamation of our Malaysian ingredients. Power rocker curry (Mutton Parathal & Crab Curry) generously poured over yellow noodles and a fact to a seafood curry mee, garnished with spring onion. Sounds sincerely appetizing right? Heat oil and fry curry paste over low heat till aromatic and oil splits. Pour prawn stock and season with salt. When curry broth is really heated through, pour coconut milk. Meanwhile, assemble noodles along the rest of the ingredients in a bowl. Pour curry over and garnish with spring onion. hi... can i change coconut milk to normal powder milk? You can if you like but I have to be honest that I have never tried before.